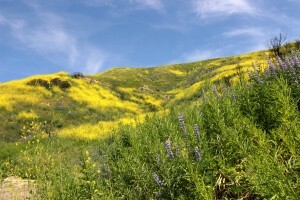 Hills of gold: The recent rain transformed the hills of Paramount Ranch near Agoura Hills into a wildflower paradise. While many people go far afield to places such as Antelope Valley to see the bloom, there any many hiking spots close to Cal Lutheran where native flowers can be seen. Photo by Gabby Flores- photojournalist. Although Southern California is known for its lack of rain and frequent droughts, this year’s super bloom flowers have caught the attention of locals. A glance outside reveals hills of yellow and orange as a variety of wildflowers break into bloom, a result of the abundance of rain this winter. “It’s so unusual to see so many flowers in bloom because everything is typically a nice shade of brown,” said Bryan Swig, a biology professor at California Lutheran University. Swig said most of the plants in Southern California are drought deciduous, meaning they germinate in late winter, flower during the spring and die before summer starts. Swig added that most of the plants, such as California buckwheat, won’t bloom until summer. “When we have an abundance of water, the native seeds that are sitting in the sea bank are capable of germinating and flowering because of excess resources that aren’t normally present,” Swig said. Aside from the rain, Swig said one of the reasons for talk of the super bloom is attention from the media, leading to fields of flowers being trampled by visitors. However, with a little care and research, these flowers can be enjoyed without harming them or their environment. Swig said the media diverted its attention to popular points of interest, such as the High Desert and Antelope Valley. Antelope Valley in particular is known for its orange poppy fields. Swig said lupins, a type of purple flower, were also popularized. “If you want to see [the super bloom] more locally, people should visit the Conejo Open Space because the natives are in bloom—and you can go as close to Wildwood [Regional Park] and Sycamore Canyon,” Swig said. Bryan Rasmussen, an English professor at Cal Lutheran, is a naturalist who took an interest in this year’s super bloom. “During the spring break, I went down to Lake Elsinore and Walker Canyon, which is the ground zero for the poppy bloom. I also went to the Anza-Borrego Desert State Park, the northernmost quadrant of the Sonoran Desert, which can be considered the largest state park in Southern California,” Rasmussen said. Rasmussen said people should also expect to find an abundance of flowers in the Santa Monica Mountains and at Carrizo Plain to the north. Rasmussen said the reason for a super bloom this particular year is not only because of the rain, but because the rain was preceded by a drought. Without this combination, Rasmussen said the bloom couldn’t have happened. “There’s a lot of controversy about the super bloom because it’s a big draw for Instagrammers. People go down to super bloom areas and I believe that one of the controversies, since Instagram just makes it worse, is destruction and the trampling of flowers or disrespecting the boundaries set for the trail,” Rasmussen said. Rasmussen said the problem with Instagram culture is that people just pull super bloom flowers out of the ground for the “perfect photo.” It is illegal to do so in state parks as most of the plants are protected, Rasmussen said. Senior Matthew Trujillo, who was an Outdoor Recreation intern at Cal Lutheran for about a year and a half, has supervised hikes at places such as Wildwood Regional Park near Cal Lutheran and Big Bear. He said it is a “general nature rule” for people to not disrespect the flower trails. According to the California Department of Parks and Recreation website, disturbance or destruction of natural scenery, plants and animal life is strictly forbidden. Additionally, all pets must be kept on leashes, and all trash must be placed in designated receptacles.